BlackBerry Curve 3G heading to WIND Mobile | BlackBerry Blast! According to an anonymous BGR source, the BlackBerry Curve 9300 3G will be offered by WIND Mobile. As you can see from the screen cap the new BB Curve 3G is in WIND's inventory system. 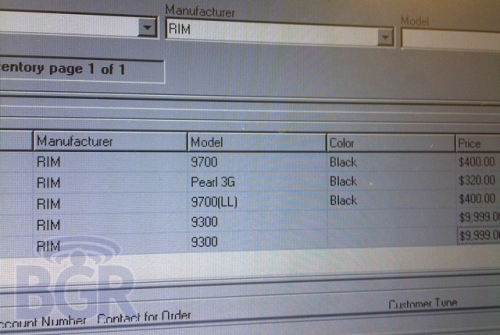 It looks like the new BlackBerry Curve 3G will be offered in 2 colors because there are 2 entries in the inventory system. No pricing or release date is known, but it does say $400 on the screen cap. Figure in a 2-year contract price and we're guessing it'll be around $99. That's just a guess though.